Today is my sweet hubby’s birthday. I won’t tell you his age…you can ask him yourself. I’ve posted about him a lot…he’s wonderful, supportive, funny, encouraging, Godly…he’s a fantastic husband and outstanding daddy to our 3 kiddos. He didn’t ask for a lot. Actually, he only requested 2 desserts…no cake. The first one I’m posting is Key Lime Pie. The other I’ll post tomorrow. Preheat oven to 350 degrees. Squeeze limes to get the required amount of juice. Zest several limes to get 1 tablespoon of zest. Combine juice, sour cream, sweetened condensed milk, and zest. Pour into graham cracker crust and bake for 8-10 minutes, or until set but not browned. Top with cool whip, if desired. This is little pie is a bit deceptive….it seems so simple. Just stir everything together, right?! However, if you don’t have a handy lemon/lime press/juicer or garlic press to juice all those key limes…or if you don’t have a zester/microplane to zest limes…this pie is a lot of work. I don’t have those nifty neato tools. But if this is going to be one of Mike’s new favorites for me to make every year…trust me! I’ll be making a trip to Target to get me some new kitchen toys 😀 Then I’ll be able to whip up this awesome pie in no time!! I don’t typically like sweets to be tart. If it’s supposed to be sweet then it should be sweet…not sour. Are you following me? However, Mike goes for all the tart/sour “sweets” every time. Sour Skittles…Sweet Tarts….Sour Twizzlers…Lime with his water…Limeades from Sonic….you see where I’m going? Okay. With all that being said…this pie was really good. I’m not just saying that because I made it. I’ve made lots of stuff that has bombed. 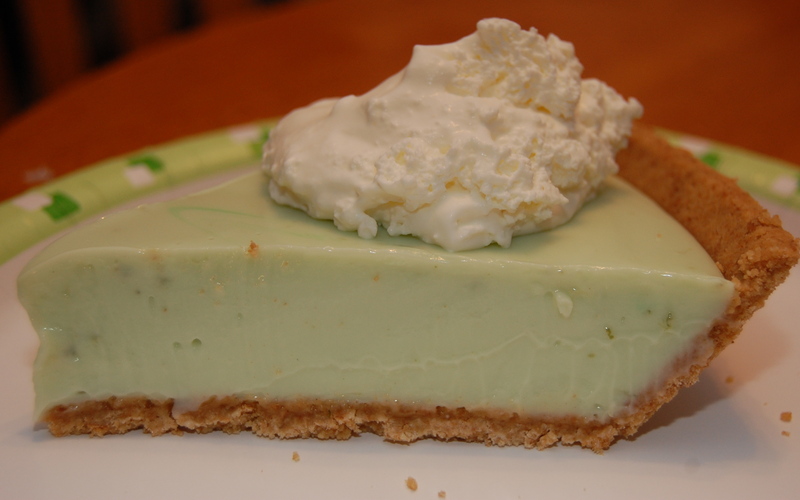 I actually attempted a Key Lime pie last year that was…uhhh…gross. But this year I was successful. Yeah!! I really think the fresh lime juice and lime zest really made the difference. And just for the record…it’s hard to go too wrong with sweetened condensed milk. Can I get an amen?! So, Mikey….Happy Birthday, Baby. I love you. The stinging citrus juice on my fingers was worth it. The fact that my hands still smell like limes was worth it.